I used to buy a new dress (or a couple of them) every holiday season. I would wear it once (or maybe twice), and lock it up for an entire year. The year after, I would get excited about new trends and purchase a new dress. I told you about my effort to maximize the cost-per-wear of my clothing items, so this year I’m recycling a dress from not one, but two years ago! Pairing it with newer items like this cape cardigan and over-the-knee boots gives it an entirely different feel, so much that I don’t feel like I am repeating an outfit at all. Lately I’ve been focusing on comfort when choosing an outfit. I love a sparkly dress, but I’m not so much into wearing uncomfortable tights and heels. 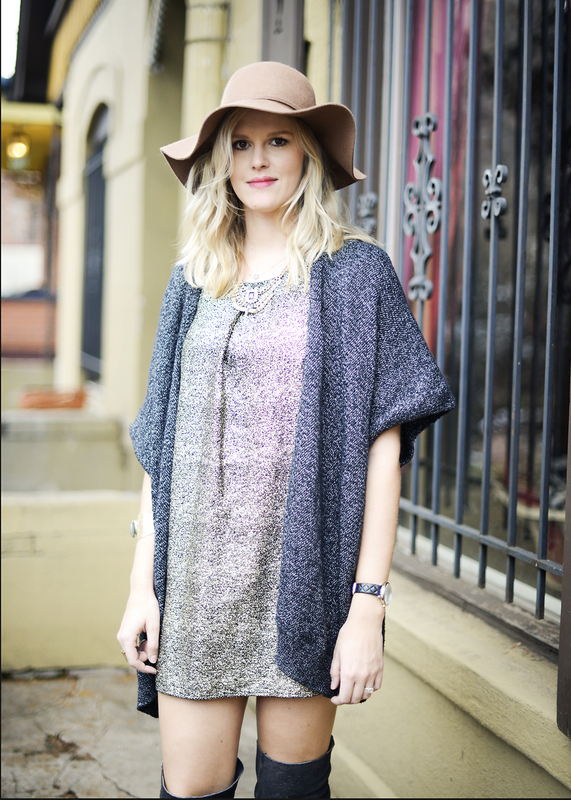 I think combining gold shift dress with a cozy cape and flat boots is a good compromise. What do you think? Are you usually wearing glamorous outfits for your holiday parties, or are you the cozy type? Do you feel like you have to wear a dress, or have you shown up to your parties in pants or jumpsuits? Dress: Threadsence (old), Cardigan: Aritzia, Boots: Free People, Hat: Target (old). You look like the outfit paired itself to you ! Perfection on Lafayette Street !! !